His career as a performer on bass and Double Bass is complemented by other areas within the recording and music production. Composer and arranger, born in Rio de Janeiro, Brazil, has developed through research and experimentation of the instrument, new ways and techniques of execution, which together with the influence of musical styles from Europe, Africa, North & Latin America; concur to enrich his music. In the scene, he has collaborated with great musicians of international stature such as Hermeto Paschoal, Greg Osby, Tom Coster, Paquito D’Rivera, Adam Rapa, Osmany Paredes, Jovino Santos Neto, Misha Piatigorsky, Robertinho di Paula and Henry Cole. He currently lives in Mexico City, where he has participated in a number of cultural events and festivals with important musicians of Mexican jazz scene such as Hector Infanzón, Cris Lobo, Chucho Lopez, Enrique Nery, João Henrique, Elizabeth Meza, Alex Mercado, Roberto “Betuco” Arballo, Victor Patron, to name a few. Marcos in now touring and promoting his new album Feira in several venues and festivals with his Trio being accompanied by the best musicians in Mexico City's jazz scene. All About Jazz musician pages are maintained by musicians, publicists and trusted members like you. Interested? 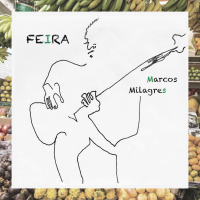 Tell us why you would like to improve the Marcos Milagres musician page.